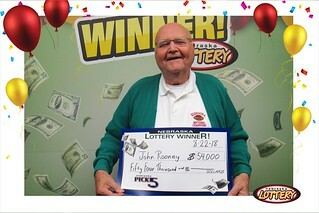 John Rooney of Colon won $54,000 playing Nebraska Pick 5 from the Nebraska Lottery. Rooney purchased his winning ticket from Hy-Vee Food Store #1185 at 840 E 23rd St. in Fremont. The ticket contained one play with the winning numbers (05, 06, 25, 30, 33) from the August 21 drawing. August 21 was more than just a lucky day for Rooney, it was also his 90th birthday. Rooney said he usually checks the numbers right at 9:30, but didn’t check them the night of the drawing. Rooney said he’s been playing the same numbers daily since he played his first Nebraska Pick 5 game back in 1994. There’s no significance to those particular numbers, he said, he just bought a ticket with those numbers and kept playing them. Now that he’s conquered Pick 5, Rooney said he’s got a good feeling about Lucky For Life. He won $150 about a week ago and that’s looking like the lucky game for him, he said. He’s been playing Pick 5 since the time the game started, but said this will probably be the last round of tickets he buys for it. “I can’t wait another 25 years to win it,” he said. Rooney said he’s probably going to give all the money to his kids, grandkids and great-grandkids. Nebraska Pick 5 is Nebraska’s unique Lottery game: all the proceeds from Nebraska Pick 5 stay in Nebraska, and all the winning tickets are sold in Nebraska at Nebraska Lottery Lotto game retailers. The odds of winning the Nebraska Pick 5 jackpot, which starts at $50,000 and grows by $4,000 each drawing that is not won, are 1 in 501,942 while the overall odds of winning a prize in the game, which has drawings seven nights a week, are 1 in 8.